Starting from Friday, a number of people in the UK received anonymous letters inciting them to assault Muslims on the 3rd of April. 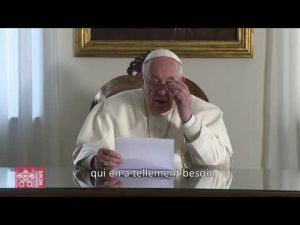 An inquiry has been opened to determine the origins of the «Punish a Muslim day» hate campaign. A hate campaign has been launched on Friday, 9th of March, inciting people in the UK, and most precisely London to harm Muslims on the 3rd of April. 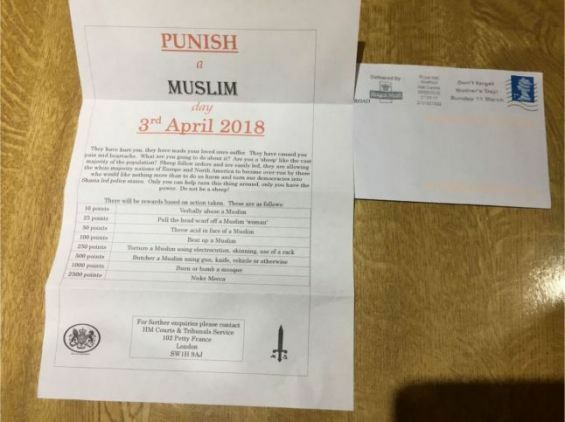 Anonymous letters were randomly sent to people in London, Midlands and Yorkshire calling them to take part in the «Punish a Muslim Day», to take revenge on the British Muslim community, reports TellMAMAUK, a national project which records and measures anti-Muslim incidents in the United Kingdom, on its Twitter account. The author of the letters goes further saying that Muslims want «to do us harm and turn our democracies into charia led police states», adding : «Only you can help turn this thing around, only you have the power. Do not be a sheep». It did not stop there as it took an aggressive turn right after this one-paragraph introduction. TellMAMAUK wrote on its website that the letter «offers points for acts of violence against Muslims – this includes verbal abuse, the pulling of a woman’s hijab or headscarf, a physical assault, and disturbingly, the use of acid as a weapon». The organization also indicated that these communications «offer more points to a person if they decide to bomb or burn a mosque». Contacted by Yabiladi, TellMAMAUK stressed that these hate letters were sent starting from Friday and were opened during the weekend. Collaborating with the Metropolitan Police, the organization based in Yorkshire urged the ones who received these letters to report it or ring a non-emergency number, 101. «We have been notified of people from across the country randomly receiving these letters. We have been re-assuring and asking them to remain alert and vigilant and that we are working with police forces to ensure that victims can get support and the evidence collected», TellMAMAUK told Yabiladi on Monday. «We have also been providing community information so that evidence is not contaminated by individuals receiving these poisonous letters», added the same source. According to the NGO, «British Muslims have been targeted (…) A national operation– co-ordinated by Counter Terrorism Policing North East ­– has been launched after a malicious letter containing messages of hate crime was reported to police by a number of people on Friday (9 March) and over the weekend». Indeed, in a communiqué issued on Sunday, 11th of March, the South Yorkshire Police’s Assistant Chief Constable reassured «communities that a full investigation is underway into malicious communications sent to addresses across the UK». Assistant Chief Constable Tim Forber said : «These communications are extremely distressing and we appreciate that members of our communities will be very concerned. «I can assure you that these documents are being taken extremely seriously and a thorough investigation into the circumstances is underway».